Yukuma has created revolutionary charging solutions for consumer electronics, energy storage systems and EVs. The solution includes new chemistry battery cells, battery management systems and power supplies. The company has reached unbelievable results – charging smartphone battery 2800 mAh from 0 to 100% in 12 minutes by Type-C cable and own developed charger. The size of the battery is comparable with iPhone 7 Plus battery, but the battery can reach more than 2800 cycles with 85% capacity retention. Other solution for EVs will solve the problem of long charging time of electric vehicles. 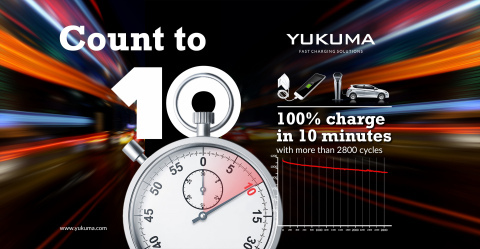 With Yukuma’s car battery cell 19000 mAh, battery pack, based on this cell, and own developed charging system, the EV can be fully charged in less than 10 minutes. The key difference between Yukuma and competitors – the technology is suitable for mass production and the cost of cells is comparable with average cost of Li-Ion batteries in the market. Yukuma is ready to prove the results and invite experts to R&D center. The technology can be applied to many products – consumer electronics, smart devices, EVs, tools, energy storage systems. Company has developed whole charging solutions for different applications. For example, the solution for EV also includes the infrastructure solution – charging station with energy storage, based on Yukuma cells, as well as the battery pack and battery management system for EV. The solution for smartphones includes battery cell, battery management system and universal charger with Type-C cable. The solutions are free from problems usually appeared with fast charging – overheating, lifetime losses, energy density decrease. The batteries show the phenomenal results with capacity retention 85% after 2800 cycles – far from any competitor. The company is going to set up the battery factory in China and discussing the investments with group of international investors.